Accessorising is a form of art. If done well you can enhance any dress and create a stunning outfit. When you have chosen your dress and you begin to think about accessories, always show restraint especially for a formal occasion. Think about the overall look you want to achieve, is it appropriate for the type of event? 1. Colour. Choose just one colour, which can either feature in the pattern of your dress or it can complement the colour of your dress. Add this colour into your jewellery, bag and/or shoes to create a ‘theme’ to your outfit. Accessorising our Aqua dress with diamonds and emeralds allows the aqua colour to really stand out. 2. Jewellery. Choose classic pieces to enhance a formal dress. Pearls and diamonds create a classic, elegant and sophisticated look for any black tie or wedding event. To stay on-trend add a statement necklace, they work best with a v-neckline or thin straps and against a block colour. See how we accessorise our White dress with statement jewellery to enhance the embellishment on the dress. 3. Evening Wrap. Keep warm and enhance your dress by adding an evening wrap or shawl. There are so many beautiful materials to choose from, with the most classics being chiffon or faux fur. For a real on-trend statement try a shawl in gold or silver. 4. Mani/Pedi. Don’t forget you can enhance any dress with a beautiful nail colour. A beautiful French polish on your fingers and toes is perfect for a formal event. For a beach wedding or day at the races, why not try a pop of colour to compliment your dress. 5. Makeup. When creating the overall look of your outfit, it is important to think about your makeup. Go for either dramatic eyes or lips. Which works better to enhance your features and your dress? If you’re going for dramatic lips, don’t worry about trying to match a lipstick colour to your dress, this can look too overwhelming; choose a complimentary shade to the dress. A pink lip and earrings match beautifully with our Coral dress, for a casual wedding or day at the races. If you want to look and feel your best, then choosing a dress that’s right for your body shape is an absolute must. With the right dress you’ll accentuate your best features and disguise the rest. The correct dress will help flatter your figure, making your silhouette appear balanced. Luckily, there are so many fabulous styles available today; there is something for everyone, no matter what your shape. Apple: choose Empire waistlines and A- line dresses. These styles have a fitted top and high waistline, which moves the attention away from your midsection. Our red dress is a seamless complement for an apple shape, as the neckline and lace detailing draws attention away from the midsection, while the flowing skirt balances the silhouette. Pear: avoid dresses which have a tight skirt, choose a flowing skirt, in soft materials like chiffon, thatwill compliment your bottom half. Choosing a dress with an embellished top will add balance and sophistication. The teal dress, with its beautiful embellished bodice, is a perfect example of how to enhance and balance a pear shape. Triangles: need to soften their top half by choosing a low cut neckline, in a ‘u’ or ‘v’ shape. Like a pear shape you need to add balance, so avoid a tight fitted skirt which will enhance your wider top half. An A-line dress is the best style for your shape. Rectangles/Ruler: add some curves with a tight fitted top and flowing skirt, this will create an hourglass illusion and really enhance your body shape. Our purple dress showcases how a beautiful and elegant silhouette can be created with a full skirt. 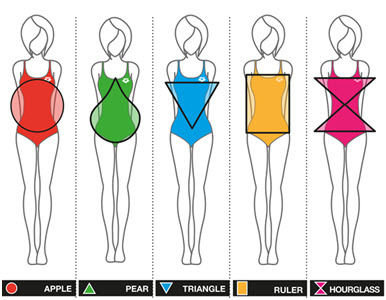 Hourglass: This is the ‘classic’ female shape which is lucky enough to be able to pull off just about any dress style. If you are an hourglass shape, you should look into other factors when choosing the perfect dress, like your height. Petite frames should wear shorter skirts, because this helps add the appearance of height. Also keep to one colour to improve the illusion of height. Tall frames have an easier time pulling off long, flowing skirts. A long skirt should touch the ankle bones; if it is shorter it will look too small. If you are tall, you also have the ability to go for bolder patterns and prints. Every woman should own at least one printed dress. Whether you choose a floral, geometric, lace or animal print, it will make a beautiful and bold statement at your next event. Prints and patterns have a long history in fashion. Printed dresses began making a statement during the ‘Romantic Era’ in the 1820’s, when the advancement of textile colouration became available. To this day, we see all the great fashion houses creating new interpretations on classic patterns and prints. Prints can be bold, romantic, quirky and fun. A print is a very versatile fashion choice, as they are trans-seasonal and can also be worn from the office, to a function or dinner. 1. Choose a print which is in proportion to your body shape. The smaller you are, the smaller the print should be. For example, when choosing a floral print, the general rule to apply, is to choose a print no larger than your hand span, 3-5cm. Our Sage Cobalt Dress is a perfect example of choosing the right size pattern to create a romantic and feminine look. 2. Choose a print that flatters your shape and makes you feel good. Geometrical prints can have a narrowing effect on the waist, if positioned correctly. Some prints can also have an overall elongating effect, like our Green Technoprint Dress with black satin trim, perfect for a special occasion. 3. Select neutral coloured accessories and endeavour to pick out a colour from the print, to match them too. This includes your shoes, bag, coat and jewellery. 4. Prints work best when they are more form fitting, a dress like our Silver Seaweed creates a beautiful, feminine silhouette and can be paired perfectly with black and silver. 5. If you are looking for a more formal or elegant look, choose a more traditional print like floral or lace and enhance stylish accessories. Winter weddings and formal events are increasingly popular, as winter provides a romantic, elegant and sophisticated setting.Many people are opting for black-tie and ballrooms. Nobody ever wants to look inappropriately dressed, so what are the rules for dressing for a formal winter event? We have put together some helpful tips to have you looking elegant but keeping warm. 1. Research the season’s current styles and trends. Magazines and online blogs can give you great inspiration when it comes to choosing your outfit, or the look you would like to achieve. Knowing what’s currently on trend will also give you an idea of what you will find in stores. You will also be able to get ideas from fashion stylists on how to accessorise a winter formal dress. 2. Choose a dress in a dark or richer colour. Think black, navy, mauve or red, like our beautiful Kiara Gown with lace detailing. These colours are very complimentary to most skin tones and work well in many dress designs. A dress like our Mauve Gown looks soft, feminine and elegant. 3. Cover Up! Winter is the perfect occasion for a floor length gown. Floor length gowns usually come in three different skirt designs; A-line, Empire and Sheath. Choose the design that best suits your body shape and personality. A dress which has a beautiful lace or chiffon sleeve or overlay, adds sophistication and warmth. A beautiful example is the Duchess of Cambridge’s wedding gown and our White Gown. 4. It is perfectly fine to complete your formal look with a coat or faux fur cover up. Most likely, this will only be worn getting to and from venues, or if the wedding is held in a drafty church. But it is important to ensure the coat, or cover up compliments the dress. A puffer jacket with an evening gown is a no go. Look for materials like wool or cashmere in black, cream or grey. 5. Adding tights to your outfit can add a level of sophistication and helps to keep you warm, but stay clear of bold patterns and colours as they will distract from your beautiful dress. Peep-toe or covered in heels will look more appropriate at a winter wedding or event, than strappy sandals. This season fall in love with colour. The traditional Autumn/Winter wardrobe usually consists of staple pieces in black, charcoal, and white. This season’s trending colours are confident but also very complimentary, so why not experiment by adding a splash of colour to your wardrobe. If you have a special event coming up, one of our formal dresses shown below will make a beautiful statement. If you’re going to go with one colour this season, go grey! This colour can be worn in a variety of stylish shades, from light to dark. It is the perfect colour to mix and match together or combine with any one of the colours listed below. Grey works well in different textures, so look for beautiful knit cardigans or wool coats. Navy is everywhere this Autumn/Winter Season. It is such a complimentary colour and so easy to style. Look for denim, blouses and tailored jackets in navy.For a bolder blue, Bright Cobalt and Royal Blue are also significantly on trend this season, and look beautiful in blue in a formal gown like our Blue Dress and Blue Satin Dress. According to Pantone’s 2015 Winter Colour report, specifically Aurora Red and Sangria are the standout shades of red this Autumn/Winter. Sangria is best described as a bright berry colour, which can be co-ordinated effortlessly with black, charcoal and grey. Aurora Red makes a sophisticated and classic statement, especially in a beautiful gown like our Burg Diamonte Dress. Nail colour is also a great way to incorporate these two shades into your winter outfit. Mauve Mistis one of our favourite colours trending this Autumn/Winter. Our Grace Gown showcases how to wear this colour perfectly. It’s ultra-feminine, romantic, and elegant. Mauve Mist looks best alone, designed in an ethereal style, with soft flowing fabrics. Paris fashion week saw a gold rush, with many designers adding it to their shows. This metallic hue, adds a little sparkle and glitter to any winter outfit. This colour is specifically matched with black this season. A gold jacket teamed with black jeans offers a sophisticated and fun outfit for a dinner or weekend outing. No matter what size your wardrobe is, we are always capable of filling it, or even overfilling into other closets. Extra storage is a luxury these days, with many people living in apartments, so making the most of your space is a must. A good clean out of your wardrobe, could see you rediscovering favourite items you had forgotten about, but more likely, finding items you should never have purchased. With the change of season here, it’s a great time to organise your wardrobe and create more space. Here are our 5 top tricks to create more space in your wardrobe. 1. Clear it out. The key way to create more space is to de-clutter. Give yourself a weekend to clean out your wardrobe and sort your clothes. If you haven’t worn an item in over 18 months, you’re most likely not going to wear it again. There are some great options available for getting rid of unwanted clothes; sell them in an online garage sale, donate them to charity or arrange a swap party with friends. 2. Cascade your coat hangers. This is where a coat hanger hangs off another coat hanger, effectively giving you twice the hanging space without crumpling your clothes. 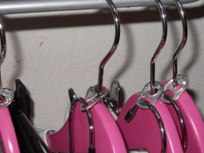 You can create a DIY version by using a soda can ring to double up your hangers. Alternatively you can purchase cascade hooks, or coat hangers from a variety of stores. This is a great way to store your dresses, although we do recommend evening dresses are stored in a garment bag before hanging. 3. Use the back of your door. Unless you have sliding doors, the back of your wardrobe door is a great place to store accessories. Not only does this area give you added space but you can display your belts, scarves, ties and even necklaces, which gives you easy access, especially for those items you wear regularly. No more digging through a box or draw for that scarf. 4. Utilize the floor. Floor space in a wardrobe is perfect for adding low lying storage boxes or cubbies. If you have the space to go vertical, you can stack on top of each other, for extra space. Shoes are a great item to store in cubbies; it keeps them neat, but on display for easy access. 5. Space Bags. The name says it all! Space Bags are a faultless way for storing clothes, which you do not need for the season. They are easily stacked and can be stored at the top of your wardrobe, or even store them under your bed. This is especially great for removing bulky items like coats and jackets in summer. There it is; that chill in the air. Autumn is here and the anticipation of winter is building. The change of season is an exciting time; the chance to change up your wardrobe, bring out the layers, cosy fabrics, jackets, boots and scarves. What’s not to love about winter fashion, there are so many wonderful fabrics and fashions to choose from. 1. Colour Jeans. Denim is undoubtedly a wardrobe essential twelve months of the year. So what styles are trending in 2015? Go with grey, burgundy or cobalt blue jeans this Autumn/Winter. Match with a neutral knit or black blazer to really make the colour pop! 2. Basic Knits. You can’t go wrong in both style and comfort by adding some soft knits to your wardrobe. Oversized knit cardigans and sweaters are on trend this season and look amazing when layered, which is a plus for extra warmth. Cashmere is a must for a luxurious look and feel. Classic stripes and neutral tones are the go to for knits this year. 3. Midi Skirts. This trend was originally popular in the 70’s and has recently come back in fashion. The classic look is staying around from Spring/Summer and can be brought into the Autumn/Winter season by pairing with some tights and a gorgeous knit top or tailored jacket. The Midi Skirt is classically a mid-calf length but there are now a variety of lengths and shapes to choose from, so there is a shape to suit everyone. Try different materials like leather or suede for some extra detail to your outfit. 4. Tailored Blazer. This is a must have item this Autumn/Winter season. AND the good news is; it is so versatile. Teamed with a Midi Skirt or a dress like our silver seaweed dress or amethyst borealis dress, it creates the perfect office ensemble. Add some killer high heels, with a blazer and colour jeans and you have a sophisticated outfit for a night out or weekend outing. A black blazer will suit many outfits and adds sophistication especially when impeccably tailored. If you are feeling adventurous, an animal print blazer is definitely a 2015 must have. 5. Ankle Boots. Are THE accessory this Autumn/Winter season. There are so many great styles available: wedge, heel, flat, laced, buckled. The trick to wearing ankle boots is to elongate the leg. If wearing them with jeans, cuff the hem to show off some ankle, or add them to a dress which sits just above the knee. Military, Taupe and Black are this seasons go to style and colours. You will find no item more versatile in your wardrobe than the little black dress (LBD). But because of its versatility, you can often feel the pressure when it comes to choosing the right LBD for you. What texture, style and design do you choose after all to cater for so many different occasions and make it still fashionable in years to come? Whether you need to update your look or are yet to find the perfect LBD, here are four takes on the LBD to give you a little shopping inspiration. Just because the occasion demands an LBD, doesn’t mean you shouldn’t add our own personal touch. A contrasting colour on the bodice will certainly take you out of the boring zone. Add some matching accessories and you will certainly add some spice to your LBD. If you’re stuck for choice or haven’t the time to traipse from store to store, then our Evening Sky cocktail dress is an excellent choice and takes all the hassle out of shopping. The vibrant aubergine pure silk contrast at the neckline and bust gives a fabulous burst of colour and the sequined skirt makes it ideal for that special occasion or evening function. If you want to stay with an all black LBD then do a variation on the fabric. A textured fabric or lace detail or overlay in black, will also add a different dimension to your outfit and ensure you still stand out. Our silk Black Opal knee length dress is designed with this concept in mind. The black polyester microgette ruffled sleeves are ideal for those steamy summer nights and easy to cover with a shawl for the cooler autumn and winter months. The easy wear and care for fabric will ensure you look your best throughout the day or night. A quick word of advice though, when wearing patterned fabrics keep shoes and accessories simple so you don’t look overdone. If you don’t want to blend into the crowd go for a bold patterns and textures in black and white or another contrasting colour of your choice. For the really brave, add a third contrasting colour like a bright waistband and you could be setting future fashion trends! To give you some ideas, have a look at our Solar Eclipse Black and White dress with sequins. It has a third contrasting colour on the sleeves and bodice for the confident woman who loves her unique individuality. For a softer look you may want to opt for a longer floaty or layered dress. You can even add a wide belt or sash to accentuate your waist to ensure that you don’t get lost in the fabric of the dress. The Black Resort dress is the perfect example of this with elbow length sleeves, black sequin detail at the neckline, and shirred waistline, it comes in a three quarter length with gorgeous horizontal contrast fabric detail. How do you do your LBD? There is no question that white is still a popular colour this season, particularly in formal wear. But if you are like most people you are somewhat reserved about wearing it in case you look like a bride turning up for her wedding. Before you give up on that dream of being a gorgeous white vision, here are five tips on how to wear white without looking like a bride. One of the quickest and easiest ways to ditch the bridal look is through your accessories. Depending on your dress and personal style you could opt for bright or deep colours for your shoes, clutch, jacket or wrap, or metallic for a slightly subtler party look. You can also differentiate through your jewellery by being a little bolder in your design choices or go the opposite way with no jewellery for a simple, fresh look. Look for embellishments, fabrics and dress designs that stand out from the normal wedding gown look. High low dresses, paneling, cutouts, stiffer textures, and sharp angles can make the perfect non-bridal white dress. Adding a splash of colour to your white dress can also do the trick. It could be subtly on the hemline, piping or paneling, or more obvious with the bodice or skirt in the different colour. A great example of this is our Lightning Ridge dress that uses patterned paneling to add colour and flair. Wedding gowns are often associated with lots of lace and ruffles, so it is best to stay away from these styles. If you do have your heart set on something lacey, look for a shorter length or a broderie anglaise style that is not typically worn by brides. To avoid the bridal look completely why not go for an ivory, off-white or cream outfit, you may even find one of these colours will compliment your complexion more than white. Our Cream and Ivory Vintage knee length dress is a great example of this. It still gives you the white look without the bridal feel and what’s more the dress is easy to accessorise and wear again and again. Do you like wearing white formal wear? What are your top tips for avoiding the bridal look? Your formal is one of the most exciting highlights of your school year. It’s highly anticipated and discussions of your dress and accessories can dominate your thoughts and conversations particularly as the date draws near. To ensure your formal is everything you want it to be and you look ever so stunning, here are five tips to help you choose the perfect formal dress. Shopping early has many advantages when it comes to buying your formal dress. The main advantage is you will have more options when it comes to styles and colours to choose from. There is nothing worse than leaving it until the last minute and having to choose from limited dresses and sizes. If you do buy your dress early in the year, remember to try it on again a few weeks out in case any adjustments need to be made to make it more comfortable for you. Keep in mind both the venue and your school’s policy on length, splits and open midriffs. Generally speaking glamorous, classic or vintage style dresses are ideal for your school formal. Also talk to your friends to get an indication of the style and dress others will be wearing. As much as you want to catch everyone’s eye you want to do it the right way and also feel comfortable, particularly at the after party. With many different body types it’s important to get a dress that will flatter your shape. Your bust, waist, hip size and even height can determine what style will look best on you. Likewise your complexion can also impact what colour you choose so be sure to try on a few dresses in different styles and colour before you buy your dress, you might just be surprised with what you find looks great on you! There is nothing worse than finding the perfect dress and someone else is wearing it! To avoid this, or at least limit your chances of this happening, find a dress that has a limited number of reproductions or purchase a dress at a boutique or online store instead of mainstream dress shops. Again, you may want to talk to your friends and other girls in your grade about what they are wearing to ensure you will stand out from the crowd. A formal dress is what you call a wardrobe investment piece; it is one of the more expensive items you will buy so you want to be sure you could wear it again. Need some formal dress inspiration? Check out our full collection for gorgeous dresses that are sure to be remembered long after the event.